Silk expert Pro is Braun’s latest generation IPL. Silk·expert Pro 5 is the safest, fastest and most efficient IPL* for permanent hair reduction in just 4 weeks*. The safest IPL technology, clinically tested and dermatologically accredited as skin safe by an international skin health organization (Skin Health Alliance). It automatically and continuously adapts to your skin tone to ensure optimal balance between efficacy and safety† for visible permanent hair removal. The fastest IPL makes it 2 times faster than the previous Silk·expert 5. Both lower legs can be treated in less than 5 minutes. It includes a precision head to tackle the smaller areas such as the face, bikini line or underarms. New compact design, 15% smaller and 25% lighter, for easy handling and effortless treatment. *Assessed on lower leg, armpits & bikini lin, following the treatment schedule. Individual results may vary. **For more information, visit Braun.com. The safest, fastest and most efficient IPL. 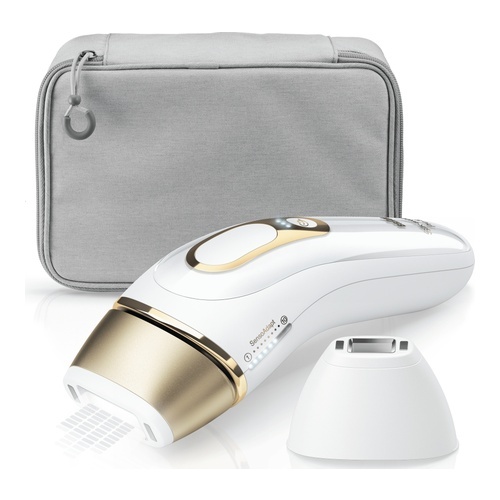 Braun Silk expert Pro 5 with the latest generation IPL (Intense Pulse Light) automatically and continuously adapts to your skin tone to ensure optimal balance between efficacy and safety for visible permanent hair removal. 100 day money back guarantee.